Linux version (Universal Binary). Tested on Ubuntu-04.12, Mint 13, Open SUSE 12.1, Fedora and Debian Stable 17 with Open and LibreOffice. Requires zenity (every good distro already has zenity installed ) and p7zip. Debian users (stable release), or users who may find problems installing our software should use the text installer. See included documentation (README_FIRST.html). Users of other distros should install wxPython, zenity and p7zip and then run the installer. 50% of every purchase made on our website is donated to charities that support sick children. Contains 20 themes for Impress, 16 for Writer, 12 for Calc and 33 Cliparts. Each license allows installation on up to 2 PCs , two licenses allow installation on 4 machines and so on. You can also download the versions for Linux and Windows and install each on a different PC (or dual-boot) for the same price. Enjoy our promotion and buy more than one license! 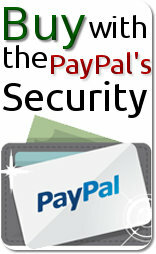 The entire transaction is safely made through PayPal. By purchasing, you will be automatically redirected to the download page.